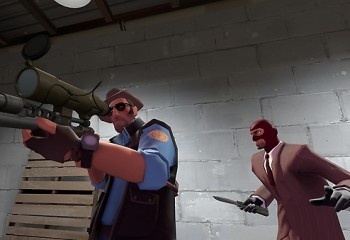 Valve paid anywhere from $39-$47,000 to each of the five creators of content on its Team Fortress 2 store. The Mann Co. store has only been open a few weeks, selling in-game items to players of Team Fortress 2. In addition to items made by Valve designers, the creations of five community members were available in the store and Valve said that they would pay royalties to the creators. The first checks just went out, and Rob Laro, Shawn Spetch, Steven Skidmore, Spencer Kern, and Shaylyn Hamm (that's a lot of "S" names) received amounts that ranged from $39,000 to $47,000. Keep in mind folks, that's after just two weeks! These creative individuals are seriously being rewarded for their ingenuity and hard work. I can only imagine that Valve microtransaction business model is working, too. "At a time when content creators are struggling with changing markets and evolving technologies, the Steam community is sending a clear message with these checks," said Gabe Newell, head of Valve. "Platforms that enable this kind of peer-to-peer exchange of virtual goods and services are going to be enthusiastically received. They create an inherently greater efficiency in connecting creators and consumers." "It's astounding that so many people want to purchase the items that came out of the community," said Kern, one of the content creators. "The response exceeded my wildest expectations. There really is no doubt at this point that there's a huge demand for community-created content in TF2 and, hopefully, more games will start to tap into this demand." The money was originally going to go to the creators' PayPal accounts but the large piles of money quickly gummed up the system. Other methods of payment were worked out, but at least two of the creators flew to Seattle to get their checks in person. It must have been pretty awesome to go to the Valve headquarters and personally get your check from Mr. Newell. Kudos!